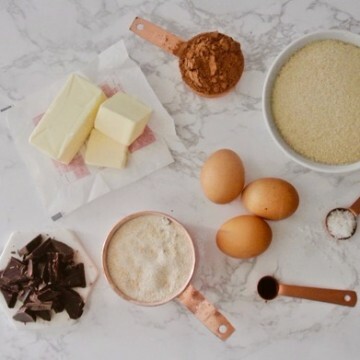 What can we say about our Salted Brownies? We like to think they are the answer between keeping it casual and serving cookies or going all in and serving cake. Simply put the salted brownie is versatile. They're transportable enough to tote along as a hostess gift and rich enough to stand up to your best carton of ice cream. Heck you could even drizzle some caramel on these bad boys! But you probably won’t need to, they are a perfect end to a meal all on their own. You also might catch us eating leftover salted brownies for breakfast the next day… this a judgment free zone right? 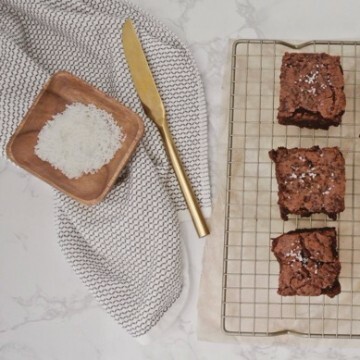 These decadent, sweet and salty brownies are the perfect crowd pleaser for both our friends with a sweet tooth and our friends who like to salt their food before they taste it. Using MiaBella Fleur de Sel, the flakey sea salt melts into the batter and accentuates the rich chocolate. Seriously, a little bit of salt will just enhance the chocolate flavor, but a good bit will really give you the wow factor of chocolatey goodness. We love whipping these up for entertaining. You can make them ahead and store in the fridge for up to 3 days. Assuming you have incredible self control that is. We do not. Usually, we make these salted brownies the night before and eat the trimmings because no one wants an ugly brownie, so we’re just doing our due diligence by eating all of the scraps we made to make perfectly square brownies. You can borrow that logic from us. You’re welcome. As we mentioned we love to make these for get togethers, usually on the more casual side because you can just leave a plate of them out and guests can help themselves. Or you could just leave the plate in the kitchen and it can be a little surprise for guests. Or maybe no one will find them and you just have to eat them all yourself or else they'll be wasted? Maybe we should just make another batch. Preheat oven to 350°. Line a 9-inch square cake pan with wax paper or foil, draping over the edges. Lightly butter the lining. In a large saucepan, melt the butter with the unsweetened chocolate over very low heat, stirring occasionally. Remove from the heat. Whisking in the remaining ingredients excluding the MiaBella Fleur De Sel one at a time until thoroughly incorporated. Spread batter in to the 9-inch pan. Sprinkle the MiaBella Fleur De Sel over the batter. Using a skewer(or butter knife) swirl the salt into the batter. 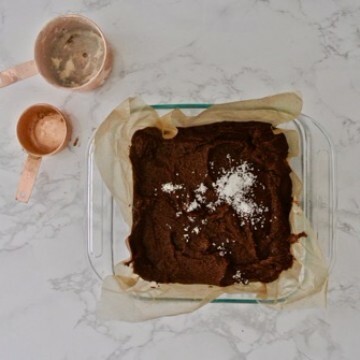 Bake the salted brownies in the center of the oven for about 35 minutes, until the edge is set but the center is still a bit soft and a toothpick inserted into the center comes out coated with a little of the batter. Let the brownies cool at room temperature in the pan for 1 hour, then refrigerate just until they are firm, about 1 more hour. Lift the brownies from the pan and peel off the waxed paper. Cut the brownies into squares. Garnish with a little extra MiaBella Fluer De Sel (as the salt on top of the batter will have melted in a bit) & serve!